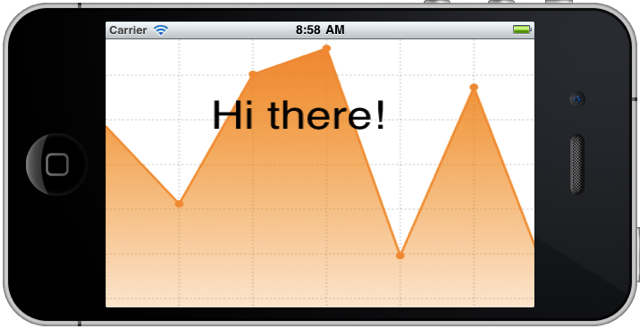 In this series of articles I am discussing the creation of charts and graphs using nothing more than Quartz 2D, a graphics rendering API created by Apple, which is a part of Core Graphics. You might wish to get up to speed with Part 1, Part 2, Part 3 and Part 4. Oops! Not exactly what we wanted: the text is drawn upside down. That’s because in the system of coordinates used in iOS the vertical coordinate goes from top to bottom. Basically, everything is drawn upside down. You might have noticed this already if you were trying to use a more or less complex graphical background. We can keep this peculiarity in mind when drawing the graph, and adjust the logic accordingly. We could use a different background after all, but when it comes to drawing text, we have to face the problem. Let’s try and understand the incantation that saved the day. The whole magic is in the six parameters, and I will only mention here those that are non-zero. You can read the detailed explanation of the logic in the documentation for CGAffineTransform. So we are changing the system of coordinates in use, right? The six parameters describe the relationships between the old system and the new system. The very first parameter describes the relationship between the x coordinate of the new system and the x coordinate of the old system. We don’t want any changes here, so the value of the parameter is 1. The fourth parameter describes the relationship between the y coordinate of the new system and the y coordinate of the old system. We only need to reverse the direction, hence the value is –1. Well, I had to change the third parameter of CGContextShowTextAtPoint to 200, to make sure that the text remains within the graph boundaries. See, we can draw text vertically – can be quite useful for drawing labels. 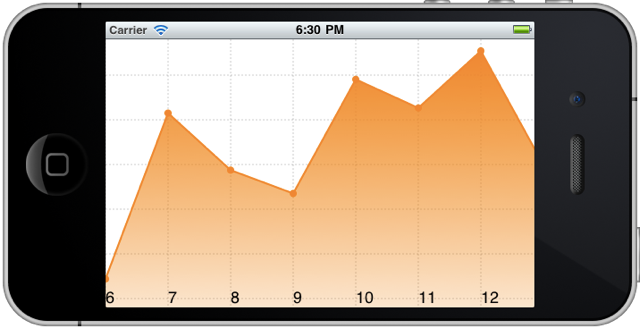 It looks okay, but it would be much better if the labels were centered under the data points, how do you think? To achieve that, we need to know the width of the label being drawn, and then make a correction to its x coordinate for a half of the label’s width. As we said at the beginning of this series, working with Quartz 2D isnâ€™t that hard, you just need to know how to do certain things and once youâ€™ve learnt them, you can move forward quickly. Now you can do everything that is needed to draw a bespoke graph of any complexity using Quartz 2D. The sky is the limit! Alexander Kolesnikovâ€™s series on Creating a Graph using Quartz 2D was split into 5 parts. You can refer to the series using the Quartz 2D Tag and access the individual articles using the links below.